Periodontal disease is caused by bacterial plaque. This plaque forms continuously throughout the day and night. Bacteria which are resident in the mouth mix with food particles and elements of the saliva to form this thin colorless layer which coats the tooth surface. With time, the soft plaque layer picks up minerals from the saliva and crystallizes. This hardened deposit is called Calculus. Calculus deposits grow as the soft plaque layers collects on its surface as well and then crystallizes. Bacterial plaque can crystallize into calculus with 24 hours. Unlike bacterial plaque which is may be removed with brushing and flossing, calculus cannot be removed with these conventional methods. Bacterial byproducts from this plaque begin to accumulate into the gingival sulcus, which starts an immune response from the body which causes gingival inflammation. This is called Gingivitis. Unfortunately, this immune response designed to confront bacterial plaque causes collateral damage of the gingiva and gingival attachment apparatus. But Gingivitis can be reversed by removing the bacterial plaque and calculus. Once removed the immune response stops, gingival inflammation resolves and the tissues revert back to their healthy state. However, if these local irritants are not removed Gingivitis can progress into Periodontitis. 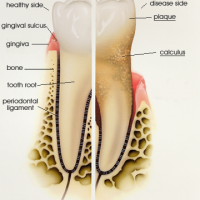 Gingivitis becomes Periodontitis as soon as the bone and periodontal ligament become involved. 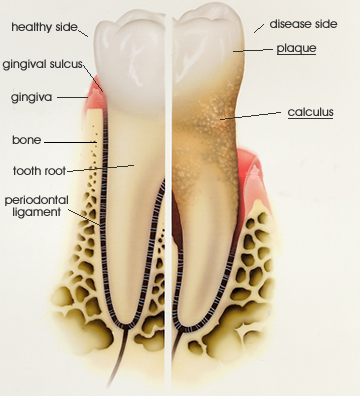 As the gingival tissues breakdown the gingival sulcus deepens, forming a gap between the gum and the tooth. This gap is called a pocket. Periodontal pockets are measured in millimeters using an instrument called a periodontal probe. The periodontal pocket is an ideal environment for bacteria to flourish. In the healthy situation pockets range from 0-3mm, the shallower the better. In this range efficient use of dental floss and the tooth brush can penetrate the pocket and remove plaque. However, once the pockets get deeper than 3mm, your ability to clean the pocket diminishes, so a vicious cycle ensues. As the gingiva continues to erode it exposes clean toot root surface which is then contaminated by the plaque. The pockets continue to get deeper. Once the pocket reaches the level of the supporting bone, the bone itself begins to deteriorate. Typically, bone loss is irreversible. Once the bone becomes involved the disease is called Periodontitis. As more bone is lost around the tooth, the tooth loses its support and becomes mobile. Ultimately, the tooth will become too loose to function with and is lost. Interestingly enough, unlike tooth decay, periodontal disease leaves the tooth intact but destroys the surrounding tissues. The bacteria that causes tooth decay do not affect the surrounding tissues, but destroy the tooth itself.